High Quality Content by WIKIPEDIA articles! Michel Chamillart or Chamillard (2 January 1652 14 April 1721) was a French statesman, a minister of King Louis XIV of France. He was born in Paris of a family recently raised to the nobility. Following the usual career of a statesman of his time he became in turn councillor of the parlement of Paris (1676), master of requests (1686), and intendant of the generality of Rouen (January 1689). His attractive personality won the confidence of Madame de Maintenon and pleased the king. In 1690 he was made intendant of finances, and on 5 September 1699 the king appointed him Controller-General of Finances, to which he added on the following 7 January the ministry of war. From the first, Chamillart's position was a difficult one. The deficit was more than 53 million livres, and the credit of the state was almost exhausted. 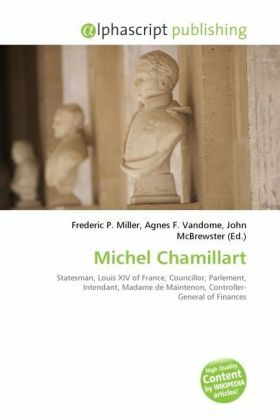 Chamillart lacked the intelligence and energy necessary for the situation, and was unable to moderate the king's warlike tastes, or to inaugurate economic reforms.